I’m a criminal defense attorney in Tucson, Arizona. I’ve tried scores of cases involving people charged with the most serious crimes. I’ve practiced in Tucson since 1988. Before that I tried criminal cases in Connecticut and New Mexico. Recently I was going through storage boxes and found these 1982 newspaper articles from the Farmington New Mexico Daily Times. They discuss a murder trial I had early in my career that resulted in the defendant being found not guilty by the jury. What struck me in reading these two articles is how inexperienced I was when I took this case. Indeed, I am a bit embarrassed when I read the mixed metaphors in my closing argument and how awkwardly my theory of the case was presented in my closing remarks. Immediately before trying this case I had worked as a prosecutor in the very same office opposing me. I had worked with Mr. Jolley and knew how good a trial lawyer he was. When having to face him for the first time as a defense attorney in a first-degree murder case I was scared and nervous. I remember working tirelessly preparing the case for trial and the many sleepless nights I spent rehearsing in my mind the cross examination of witnesses. When in the courtroom, the devastating cross-examination I had prepared in bed rarely came across as planned. The judge sustained objections by Mr. Jolley to questions I asked of witnesses; my objections were overruled. 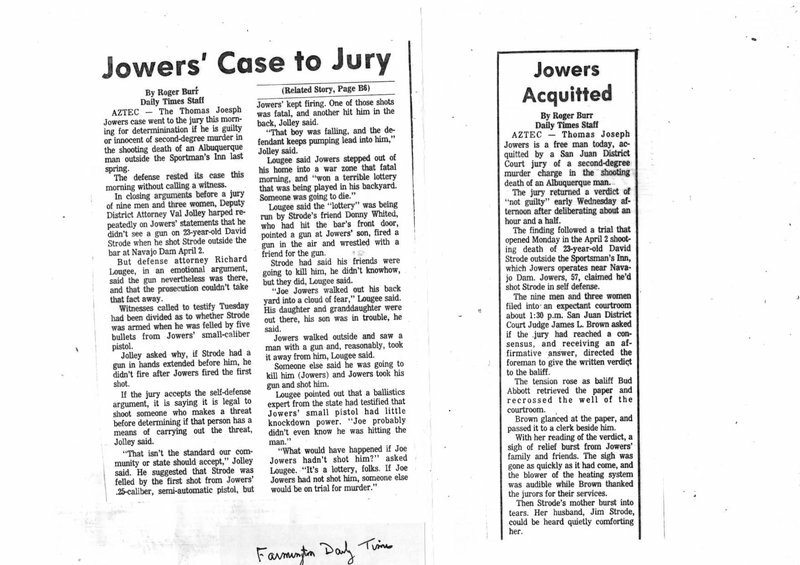 Looking back that I won an acquittal for Mr. Jowers murder charge now seems nothing less than a miracle. I was inexperienced, had bad facts to work with, and was opposed by a skilled prosecutor. But the news articles do describe a quality I had in 1982 and I still have today: a passionate belief in my client’s case and my desire to see he or she receives my very best efforts. The legal system has changed in many ways in the 35 years since I won Joe Jowers’ acquittal in an old courtroom in San Juan County, New Mexico. Rules of evidence make it more difficult to present a defendant’s case to the jury, many judges have become timorous in the face of assertive prosecutors and the prison sentences have become ridiculously long. However, for me these changes have only made me more committed to help an individual facing the formidable resources the government arrays against him. So the passion I had as a young criminal defense lawyer in 1982 I still have today. And neither law school nor experience gave me that passion to help the underdog. I had it as a boy; I have it now. I guess you could say in some ways a good trial lawyer is partly born and partly made. So when you are in trouble, facing criminal charges make sure the Tucson criminal lawyer you choose is both experienced and passionate about protecting your rights.